Medallion quilt layouts have a central area that often dominates the overall design. Other design elements are sewn around the center, increasing the quilt's size as new 'rows' are added around the center. Medallion quilts can be created with patchwork, applique or a combination of those techniques and others, such as embroidery. 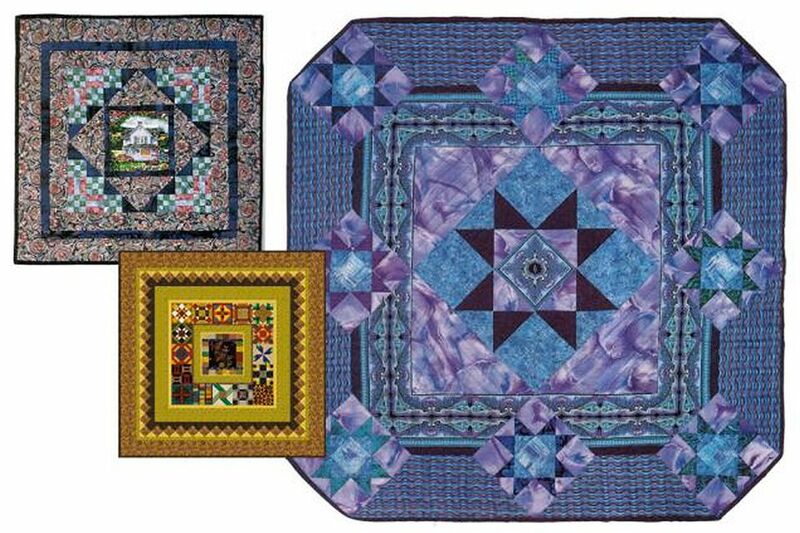 Medallion quilts can be arranged with their center quilt blocks on point, like the two top quilts in the illustration or in a straight setting like the quilt shown lower left. Either medallion style can be surrounded by borders or more quilt blocks, and we usually see a mixture of the two in each quilt. You can change the design in any way you wish as you work outwards in the layout. A focal fabric is used in the little medallion quilt shown upper left -- a fussy cut image of a house. Patchwork radiates outwards from there. Bottom left is the Backwards Medallion Sampler quilt, assembled with a combination of blocks and borders surrounding the center. To the right is a medallion quilt that includes a mitered border print fabric cut so that mirror image strips meet to form a kaleidoscope at corners. The center of the medallion quilt with border print borders is surrounded by corner triangles first. The triangles are cut by dividing squares in half once diagonally so that the fabric's straight grains, lengthwise and crosswise, run parallel to each triangle's short edges. If the triangles were cut as we do setting triangles, by dividing a square twice diagonally, the stretchy bias edges would be parallel to the short edges, where they would probably become distorted as you add more pieces to the quilt. You may see groups of quilters who are participating in a round robin exchange. The end result is a medallion quilt. Here's how the exchange (normally) works. A group of quilters join the exchange and agree to work on each other's quilts. Each quilter sends a 'starter' block to someone on the list of participants. Quilters can usually send fabric (but that's optional) and can offer design ideas for their quilt. The first person who receives the starter adds design elements around its sides. The quilter may or may not follow the wishes of the quilter who sent the starter (read guidelines before joining an exchange). When finished, each member of the group sends the partially completed quilt to the next person on the list. The quilts all arrive back home when everyone in the group has completed her or his share of the sewing. It's best to know the people you are exchanging work with before you join. Hostesses always create guidelines, but some quilters are beginners and may not add design elements that are as intricate as the work of others. No matter what type of quilting swap you join, think of it as a fun experience and don't expect perfection from everyone in the group.